This week has been a pretty quiet one, with not much to report on the preparations for any of our trips. In fact, the only thing to report is that I've bought a BMW low seat for the Adventure from ebay, so we'll see if that makes the bike less intimidating. That, and I've temporarily fitted a spare Autocom intercom to the Adventure so I can hear my ipod when I go to Ireland at the weekend. Only trouble is, I've left the suppression lead for the GPS attached to my other GS, so won't be able to hear the directions through the Autocom (as it buzzes too much without it). This week is already shaping up to be even quieter, as Tracy and Carlie are in Egypt for the week - hopefully she'll update her own blog so you can read all about it! So much for that plan! Last week I wrote that it was my intention to ride to work on the Monday and go over to Nikki's to change bikes and put the Adventure back into storage. Well, shortly after I posted that entry, I was chatting to Tracy about how big, heavy and intimidating the Adventure is when compared with the normal GS, and how I was getting a bit concerned that it might not be the most suitable bike for our RTW trip. Basically, I was having doubts, which stemmed from some trouble I had moving the bike around our back yard to get it into a position where I could clean it. 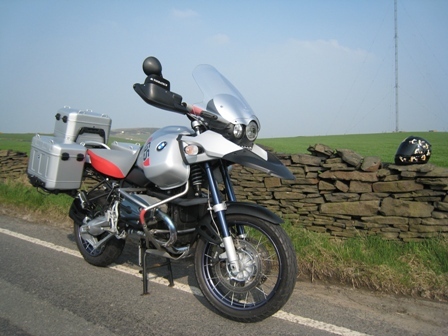 Anyway, I decided that I would look to use the Adv for my upcoming trip to the NW200 in Ireland in May, where I can really assess its suitability. So it stayed here for the week. Come Saturday, I realised that I would need to get the Sat Nav cradle off the other bike so I can mount it onto the Adv to test it out and help Colin & I find campsites in Ireland (and the nearest Guiness pub...). So I rode over to Nikki's and swapped bits from one bike to the other. Saturday night we were out with some friends from Blackpool, at Guys Thatched Village just off the A6 near Garstang - if you go there, be sure to reserve your table as soon as you arrive... we had booked one for 8.30pm, arrived around 7.30 and enjoyed a few beers before going to get our table at the alloted time... then we waited...and waited...and waited. We didn't get seated until nearly 10pm, so by the time we'd eaten and driven home it was quite late! Normally that wouldn't have been an issue (although we're hardly night owls these days! 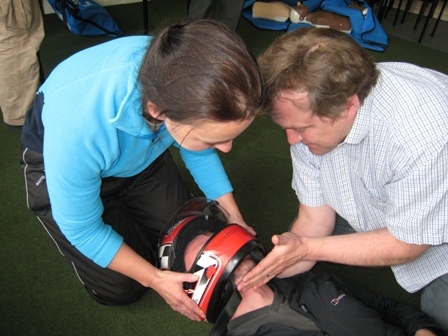 ), but on Sunday morning we had to be up early to ride over to Leeds for a Motorcycle Emergency First Aid course. The course itself was pretty interesting - more so for me, what with Tracy being a nurse! 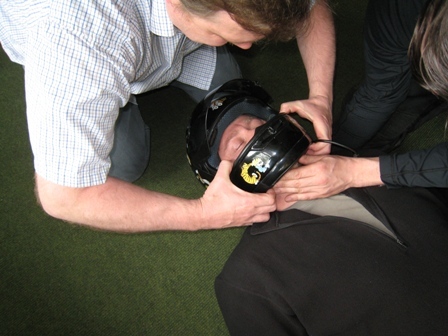 We learnt how to manage an accident scene, do CPR as well as learning the correct technique for removing a motorcycle helmet (and the circumstances under which this should be done - which is basically only when absolutely necessary to save someone's life...). Following that we were exhausted - possibly due to trying to sleep on a full stomach the night before - so we rode home and collapsed in front of the TV to watch the MotoGP race which I'd set the video recorder for. So now I'm a trained first aider, with specific training on dealing with a variety of potential motorcycle related injuries. Just hope I never have to put that training to use - and that if I do, I can stand back and watch as Tracy applies her much more thorough training to the task! On Thursday evening I rode over to my sister's mansion near Blackpool to swap my regular R1150GS for the Adventure model I've bought ready for our round the world trip. My reasoning was simple - it had been sat in her garage for several weeks and since I bought it I've hardly ridden it. I also wanted to have a really good look round it so I can work out what I need to change in order to prepare it for the trip, even though I won't start doing so until much later this year. Despite having sat unused and having acquired a layer of dust it started first time, and I enjoyed the ride home. Comparing the 2 bikes, which are theoretically very similar, kept me occupied all the way home. The Adventure is much taller - so much so that I can only just reach the ground with my tip-toes, the suspension seems more plush, and the engine and gearbox are much smoother - I guess that might be down to the difference in age and mileage, as the non-Adv version is 3 years and 11k miles older. Over the weekend I've adjusted the suspension - dropping the preload down to soften it up a bit which results in it being a bit lower, helping me get my feet down better, and spent a lot of hours cleaning and examining the bike from close up. It really is in excellent condition, as you can see from the picture below, taken on a short ride up into the hills on Sunday afternoon. I'm going to ride it to work tomorrow, as I need to be near Leeds and the traffic is terrible in a morning, and then return it to the security of Nikki's garage where it can stay tucked up until I next get the urge to ride it - which is likely to be in June, when we are attending the Horizons Unlimited meeting near Derby. When can we go again? Isn't it funny that when you finally get away for the weekend, it's over all too quickly and it's time to head home... well, this weekend feels like that. Tracy and I have just got in following a superb weekend in the Yorkshire Dales. We rode up on Good Friday, taking a rather long route up towards Skipton, before hitting some terrible traffic and heading to Settle, where we stopped at the "Naked Man Cafe" for a drink and some lunch. 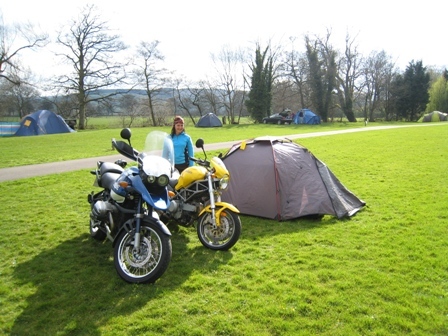 Then we rode up through Horton-in-Ribblesdale and finally on to Hawes, where we hoped to stay, but the campsite was full, so we rode on to Aysgarth and found a lovely site just on the outskirts of the village. All pitched up and then off to the pub for a few beers and some "home-cooked" food before staggering back in the pitch dark, through fields populated by sheep with strange glowing green eyes (I kid you not, their eyes shone green when in my torch-beam). 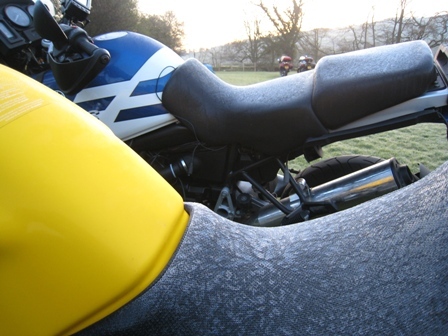 The following morning was frosty and clear, but soon warmed up so we headed off to Kendal, taking the scenic route and thoroughly enjoying the twisty roads, despite the bumps (Tracy did seem quite jealous of the BMW's suspension - Lydia hardly has any!). We chilled out for the day, wandering round town, heading back reasonably early and stopping in Kendal for some beer and cheese (Wenslydale, naturally) which provided a truly enjoyable evening meal. Easter Sunday we decided to leave Lydia behind and head off 2-up to Ambleside to explore the camping shops, again in glorious sunshine. Despite heavy traffic we rode up to Keswick where we had fish & chips for lunch before finally heading back to camp, where we relaxed in the late afternoon sunshine - simply a perfect day. And that brings us to today, which dawned cloudy and colder. The ride home was more direct than Friday's ride up, as the drizzle started, the wind picked up and at one point north of Hebden Bridge we were caught in thick fog... at least we got home before the worst of it hit, and a nice warm bath soon thawed out our cold parts. So now we're sat enjoying the rest of the weekend and chatting about how superb it's been, just getting away on the bikes with the tent and no real plan... perfect... now, when can we go again? As with all our plans, this one starts with a beginning and an end, but excludes much in between! We'll set off sometime tomorrow morning and return on Monday sometime. Apart from that, the world's our lobster... or something like that! Actually whilst we don't have a plan, we do have a collection of stuff we'd like to do - naturally that involves riding the bikes, drinking some beer, eating some great food, perhaps some walking on hills, taking some pictures (so tune back in next week when I might even post some of them here! ), and generally chilling out. It's been a busy week at work for both of us, so we're just going to kick-back tonight and sort the rest out tomorrow... tune in next week to discover how our first ride together in over a year went!